Thank you OXO for sponsoring today’s recipe. There are affiliate links in this post. As always, all opinions are my own. I’m so excited to tell you about a new cookbook with seriously satisfying, truly simple, good-for-you (but Not Too Good-for-You) recipes for real life. It’s called Healthyish. 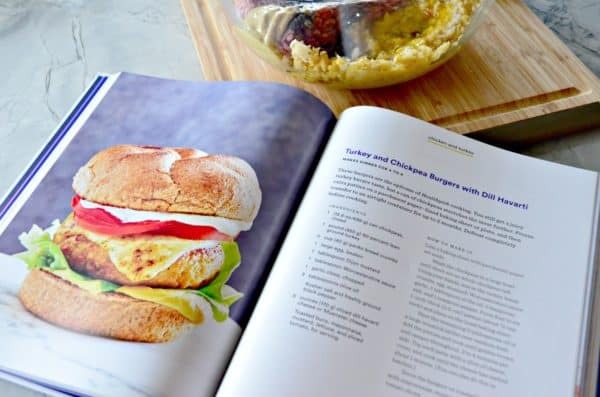 My friends at OXO sent me a copy as well as some products to try out this recipe for Turkey and Chickpea Burgers with Dill Havarti. I’ll be honest. This is a recipe out of my comfort zone, but I was up for the challenge. My husband was beyond excited to try something that wasn’t my normal go-to flavor profile to cook. I’ll note: it wasn’t because it was crazy hard to cook–because let’s face it. It’s the most ideal meal to make on a busy weeknight when your craving driving thru burgers. It only took me 20 minutes from start to finish to whip up these burgers. Plus–much much healthier and you get to control what’s in your sandwich and on your plate. 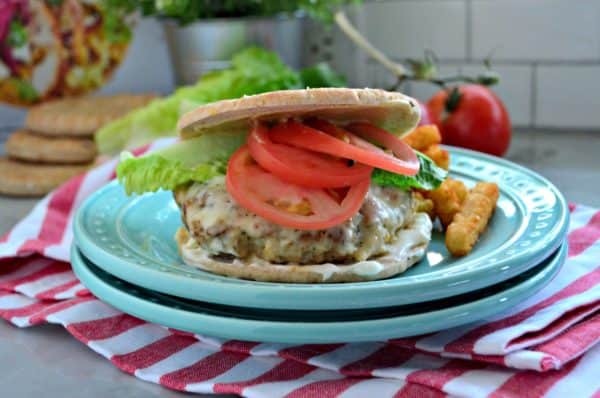 Let’s take a minute to talk about the tools you’ll need to make these delicious turkey and chickpea burgers! I’m in love with the 2 Qt Silicone Collapsible Strainer. I love how the flexible silicone opens easily and closes flat for easy storage. It also fits perfectly in my smaller portion of my sink for easy rinsing and pouring! To smash the chickpeas I used the Smooth Potato Masher. It puts less pressure on your hands while mashing; soft, horizontal handle lets you press straight down as it absorbs pressure. I placed all the ingredients in a 4.5 Quart Glass Bowl. These bowls are the best you guys. They are oven, freezer and microwave safe. Generous rims allow for easy handling when mixing, pouring and cleaning. Not pictured is one of my new favorite kitchen tools– the Non-Stick Pro Half Sheet Jelly Roll Pan – 13″ x 18″. It’s a commercial-grade, heavy-gauge aluminized steel provides fast, even heat distribution and lasting durability and stability. Micro-textured pattern ensures even baking by minimizing surface contact and promoting airflow. I used this to place my patties on before I went to cook them. A few of my other favorite OXO products: OXO Stainless Steel Measuring Cups, OXO Stainless Steel Measuring Spoons, OXO SteeL Can Opener, OXO Bamboo Wood Cutting Board, Large Stainless Steel Flexible Turner… and honestly the list goes on. My kitchen is FULL of OXO products. I’ve been a long fan of the products even before I ever started blogging! I’m so happy that I had the chance to try this recipe for Turkey and Chickpea Burgers with Dill Havarti. It got me out of my comfort zone and introduced my family to a new go-to healthyish recipe! 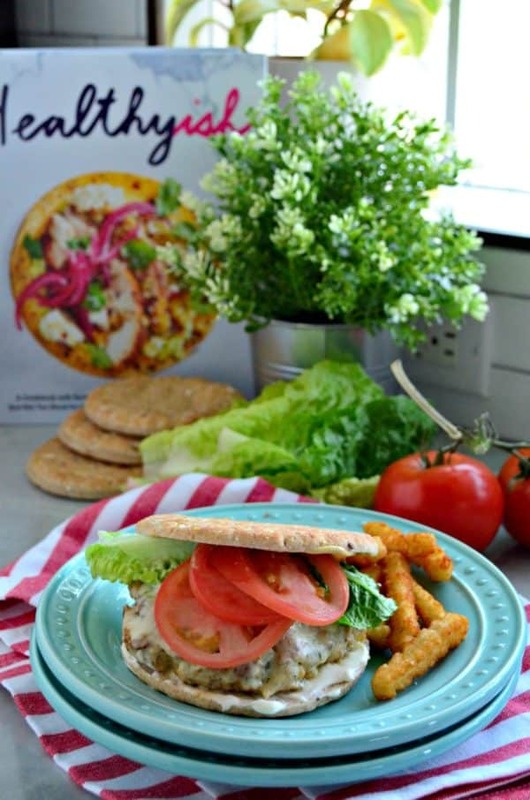 If your looking for a delicious turkey burger to try you must try this recipe! 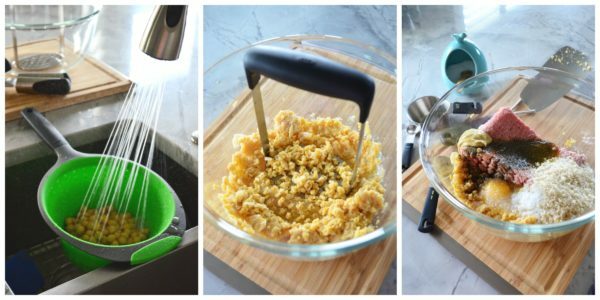 Mash the chickpeas in a large bowl until there are no whole chickpeas left. Using your hands, mix in the turkey, bread crumbs, egg, mustard, Worcestershire sauce, garlic, 1 tablespoon olive oil, 2 teaspoons salt, 1 teaspoon black pepper. Form four to size 1-inch thick patties (about 1/2 cup each) and place on the lined baking sheet. Serve the burgers on toasted buns with mayonnaise, mustard, lettuce and tomato slices.